"Beginning Genealogy Classes - 2019"
The Wabash Valley Genealogy Society (WVGS) is offering a series of classes to help individuals begin their family history quest. The Beginning Genealogy Classes will be held on Tuesday evenings. Every week different WVGS members will be giving instruction in their areas of expertise. These individuals love genealogy research and want to share it with you! 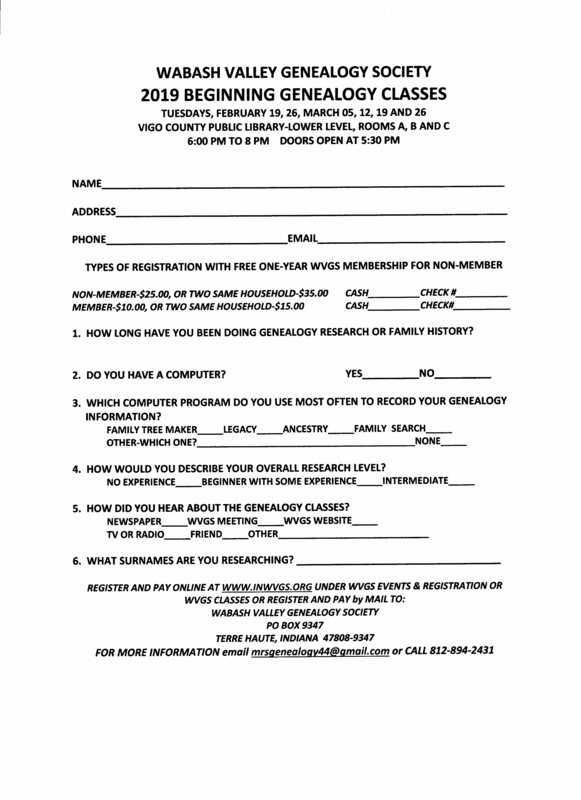 If you have any questions, please email wvgs@inwvgs.org or contact Pat Rogers at mrsgenealogy44@gmail or Dea Guerri at MARCIIphoto@aol.com.